The ground bait bread crumb method was originally used by match anglers as they found it to be a highly effective angling tactic. Today there are many carp anglers that have caught numerous medium to big-sized carp whilst using the method as a fishing technique. The method is a highly effective fishing tactic that has caught me many big carp from numerous English lakes. 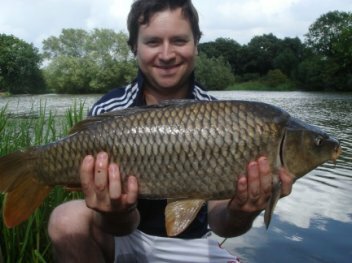 In fact, for most of my fishing sessions I regularly use the method, if I want to almost guarantee a fish and avoid blanking altogether! But how can we bait well to encourage carp to feed when using method and groundbait tactics? One method I like to use is the one I call, “bait heavy but don’t fill them” policy. This is where I catapult out numerous balls of ground bait crumb but each ball only contains liquid attractants or powdered ingredients without many actual food items. This will give all the best attraction from the smell of the flavours that leak out of the bread crumb, but without many food items so the carp will not become full and end up leaving the swim once they’re satisfied. This works because it causes the carp to get frustrated with a promise of food but it’ll never satisfy their increasing levels of hunger. I think it makes the carp keen to pick up hookbaits more often and they seem to take more risks when feeding. My exact method is to put out 5 or 6 methods balls on arrival at the swim. I target a smallish area that is suitably clear and where the method balls will show up well on the bottom for good attraction. I try to get them in a fairly tight spot, but not too tight as I want the carp to be moving about the area quickly. I put out two of my rigs in medium-sized PVA bags full of solid food items such as pellets or chopped boilies. With these rigs I can use large hooks as they’ll be nicely hidden inside the PVA bag. The large hooks will give me a better chance of banking a big carp without fear of regular hook pulls or fish losses, like what can happen when using smaller hooks. These two PVA-bagged rods will be placed on the ends of the pod, so they are positioned on the outer parts of the mass of groundbait balls in the swim. They will become the left and right rods of my three-rod set up on the pod. I set up the middle rod to fish for carp using the method feeder tactic, and use the same sized method balls that I’ve been catapulting into the swim. Now, what I believe this fishing tactic will do is force the carp into taking the PVA bag rigs even if they normally associate PVA clusters of bait as dangerous. They‘re more likely to take the risk because the numerous method balls of fine bait is not filling them up; they are not being satisfied nutritionally. The carp start to become more and more frustrated as the smell of the attractants make them crave for solid food items every few minutes. Also, if there are some big carp that refuse to take the PVA clusters, maybe because they’ve fallen for this technique before, then the method will still be effective to catch these wiser carp out. This is very likely because they may have seen other fish eat, or maybe have themselves eaten, some of the broken down groundbait balls in the swim. If no fish have been caught so far, then they’re more likely to have a go at the method ball rig, especially after they see the big, tasty-looking hookbait positioned next to a method ball! Bigger baits in PVA rigs also have the benefit of limiting potential problems with nuisance fish which are inevitable when using the method fishing tactics. I prefer to bait up frequently with the method, rather than whacking in 30+ balls at once. Placing in 5 balls every 20 minutes is far better because I get chance to renew the attractant scents in the swim. Plus, it’s better to use smaller balls for each batch as I don’t want to disturb any fish already on the bait. As a tip if you need to cast greater distance with the method then use more white bread crumb. This binds better than brown crumb so it holds together better for hard casting! Another tip when forming groundbait balls is to leave them formed as a ball for a few minutes then wet your hands and dampen each ball. This causes them to form a hard skin around the surface and allows you to catapult them further. The hard skin also helps them retain their shape as they fall through the water, then the carp have to attack them to release more of the flavours from the mix! How Sharp Are A Carp's Senses, Do They Have Good Smell?